Answer: First, let me say that I’ve been answering students’ questions in Sky Lights for over 5 years now. So if you’re new to my blog, welcome! I hope I can help with your science lessons. Your question is a good one. When I answer a reader’s question, I always try to keep my explanation as simple as possible. Your question has several answers, because there’s multiple “connections” involved. They’re more historical connections than scientific connections, but they are connections. Let’s talk about Easter first. It’s an important religious holiday for all Christians, celebrating the Resurrection of Christ. The first connection is between Easter and the Vernal Equinox. The date on which Easter is celebrated can be anywhere from March 22 to April 25. This wide range is a result of how the date is calculated according to religious tradition. Easter will be celebrated on the first Sunday after the first Full Moon after the Vernal Equinox. It’s actually a bit more complicated, but that’s close enough for our purposes. In many early societies, the Vernal Equinox was considered the start of the year, the birth of a new cycle of seasons, and a harbinger of life and growth. Christian hierarchy wanted to keep the celebration of Easter correlated with the Jewish Passover, so that’s how the “first Sunday” rule came to be. An exact historical date for the Resurrection is not known. Bless, O Lord! we beseech thee, this thy creature of eggs, that it may become a wholesome sustenance to thy faithful servants, eating it in thankfulness to thee on account of the resurrection of the Lord. The final connection isn’t really a “connection,” but it is a long-standing urban myth. 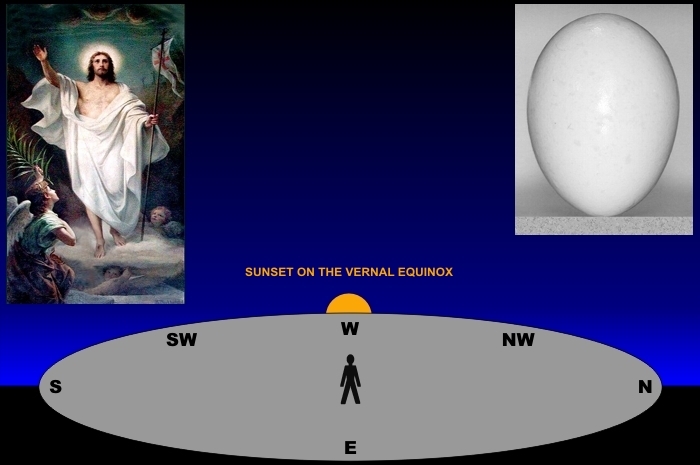 I’ve done considerable research on this topic, and get questions about it every year around the Equinox, but have no idea when it got started. FACT: It is no easier to balance an egg on the Equinox than it is on any other day. Period. I do have an idea how this myth got started, and I discussed that in my March 19, 2012 Sky Lights. I hope I answered your question, VT. Do a good job on that essay now. Any more questions, you know where to find me.